Deep trance identification for athletes. Sports psychology to model your favorite athlete. NLP mp3 and guided imagery mp3. 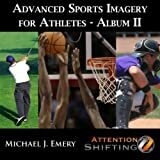 Guided visualization mp3 for athletes to better understand how their teammates practice and play sports. Pressure is a natural part of sports, but most athletes don't understand how to perform under pressure. This guided imagery and NLP mp3 will teach you how to play your sport under pressure.